Here at Farm Jeep, we have focused on flat fender jeeps. 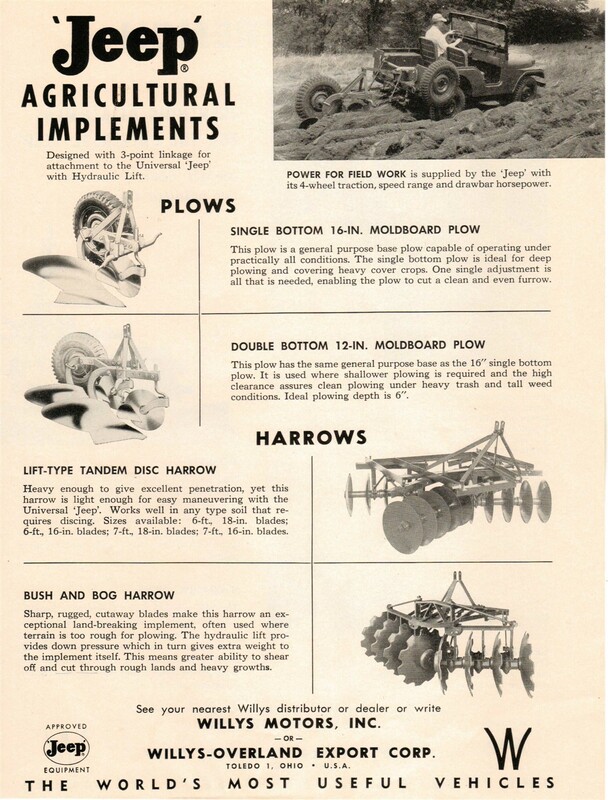 But an ad appeared on e-bay that clearly shows agricultural activities were still an important part of the new CJ5 model in 1955. 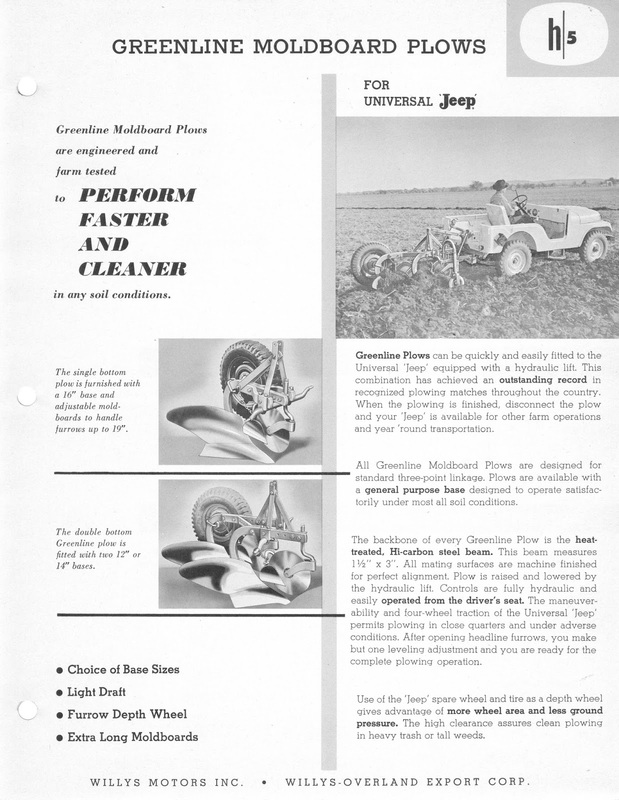 The jeep pictured in this ad may be a prototype (note the split windshield), but here we are with Jeep promoting its agricultural implements. Of special interest to us are the graphics used for the two plows. They are identical to those used by Newgren in the late 1940s. It would appear that the original Newgren design was alive and well. Whenever we have a plow question, we contact our friend Clint Dixon. As always Clint had some interesting facts and history to help us learn more, if not solve our latest mystery. Not sure if this is newer or older than the ad you found, but I’ll bet they are the same plows. I have done exhaustive searches and I can find very little information on the Green Manufacturing Company of Bowling Green Ohio, other than they were listed in the Red Tractor books as early as 1950 as manufactures of Jeep cab seals. 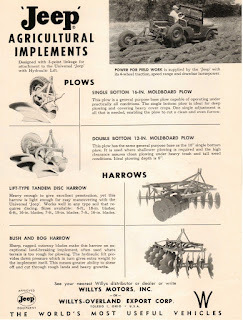 They also apparently manufactured splined adaptors and various link repair parts for hitches on tractors. Okay, here is my theory – though I have been unable so far to prove it. I have a hunch that Robert Henry Green started his own ag supply company “Green Manufacturing” after leaving Newgren. If I remember correctly, this was shortly after Bantam took over Newgren under the Monroe Auto Equipment Company umbrella of management. I would be willing to bet that Robert continued to supply Willys with plows under a new name – Greenline. Several years ago, I did find a website for what was left of Green Manufacturing. I was never able to get any response from anyone there though their site hinted at a history of producing agricultural equipment. 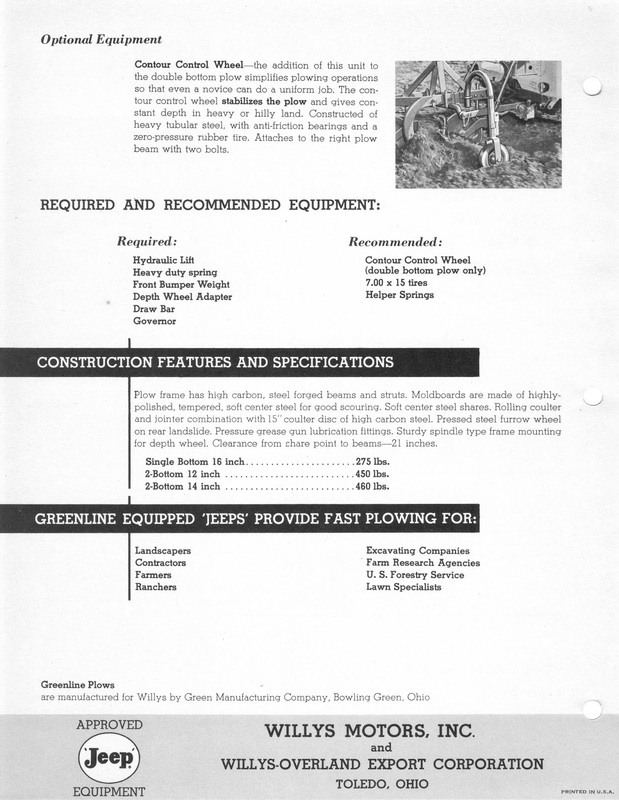 I have also seen at least one Greenline plow for sale on the internet, though it was probably from the 70’s or 80’s and was way way too big for a Jeep. The company was apparently sold and what remains now manufactures man-lifts. Just when you thought the plot could not get any thicker…. 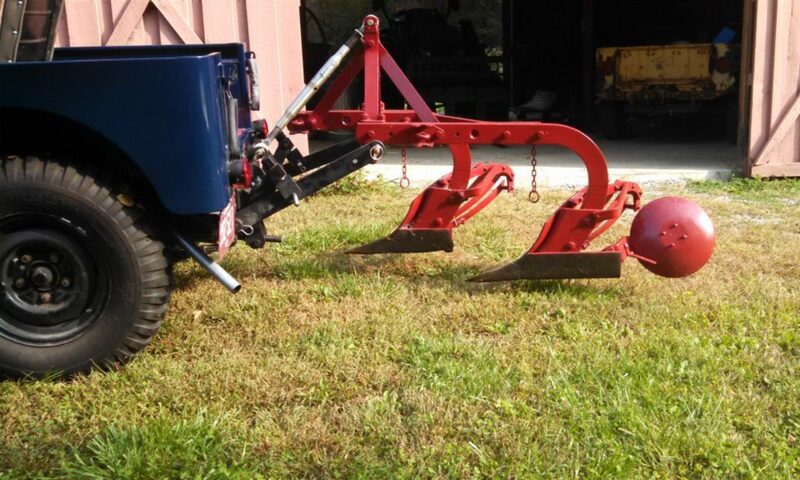 So could some of the Newgren style plows found without tags or labels have been made by Greenline? Did Jeep label their plows? Did farmers care if their new plow had a name? Is a plow that looks like a Newgren and doesn’t have a tag still a Newgren? 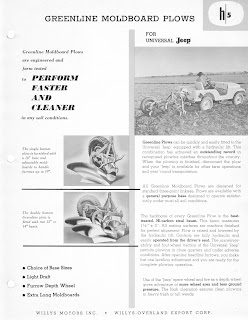 And how long did Jeep continue to offer the Monroe lift? More questions to answer. I don’t think Newgren plows necessarily have to have the label to be considered a Newgren. I know of several Ford guys who collect Dearborn plows regardless of whether the Dearborn tag is missing or not, also Ferguson guys who collect Ferguson plows with or without the tag. Of course a plow with the original tag is preferred but not absolutely necessary if one can prove the manufacture of the plow. Now, if Greenline or someone else took over marketing of a plow from Newgren or Bantam or whoever, continued to sell the same identical plow but without the Newgren tag, I don’t really know if it would be considered a Newgren plow once that company had gone out of business. I think it would then be considered to be a Greenline. But, without a Greenline tag or decal, I guess it is hard to say. I do know that Newgren plows were advertised wearing Monroe decals when they were shown in the Monroe literature for the Dodge Power Wagon. The Newgren tags appeared to have been removed. Don’t know if this was just for advertising to boost the Monroe name, or if it was because of the riff between Monroe and Newgren/Bantam at the time.